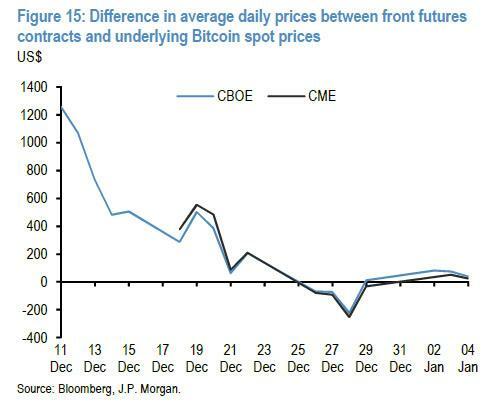 In retrospect, the launch of bitcoin futures one month ago has proven to be a modestly disappointing event: while it helped send the price of bitcoin soaring as traders braced for the institutionalization of bitcoin, the world's most popular cryptocurrency has stagnated since the beginning of December when first the Cboe then CME started trading bitcoin futures, trading in a range between $12,000 and $17,000. 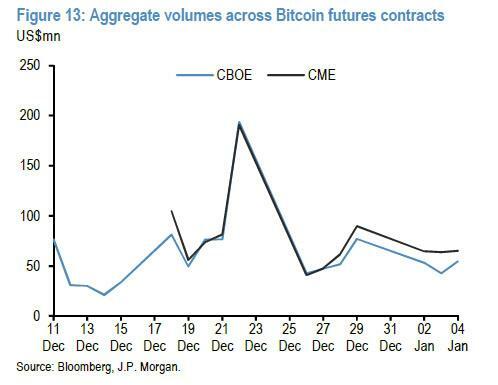 Then, as JPM's Nikolaos Panagirtzoglou shows, after a spike in volumes to around $200mn on 22 December, which saw sharp swings in underlying Bitcoin prices, volumes have averaged around $50mn and $60mn per day on the CBOE and CME futures, respectively. 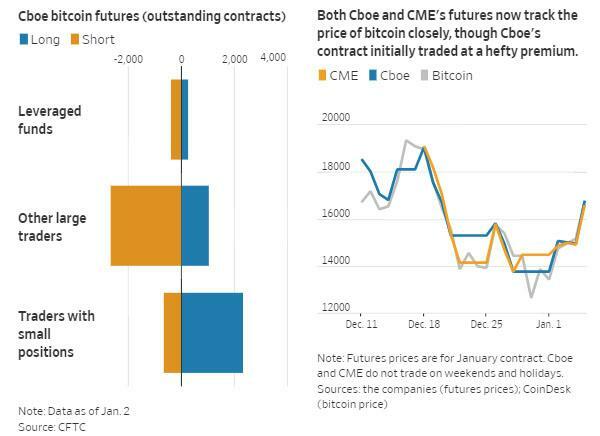 And sure enough, presenting JPM's data in a slightly different context, COT data shows that hedge funds and other money managers had placed almost 40% more short bets than long bets last week. Of course, it's not just bitcoin. 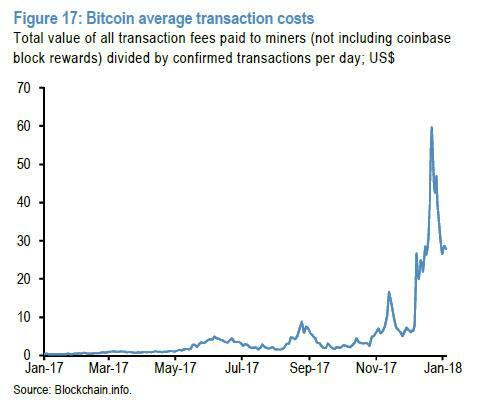 Other cryptocurrencies - mostly ethereum and ripple - have benefited from the increased interest in Bitcoin amid the listing of exchange traded futures, as well as the sharp rise in Bitcoin average transaction costs from around $6 per transaction in early December to nearly $60 per transaction on Dec 22, before settling in a $25-$30 range in recent days. 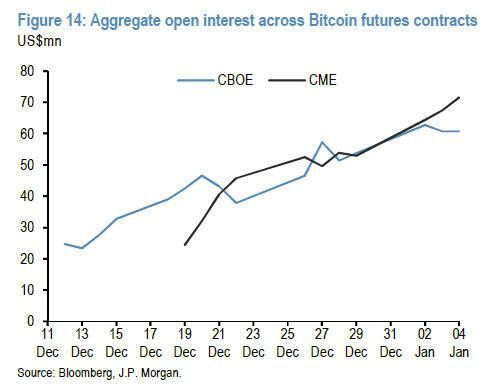 And while we await futures contracts to be announced on other cryptos, most likely ethereum and ripple next, events which we believe will be catalysts for substantial price upside in both cryptocurrencies, the question for bitcoin is who will be right: institutions, who are short, or retail investors (especially those in Japan and South Korea) who remain fervently long. 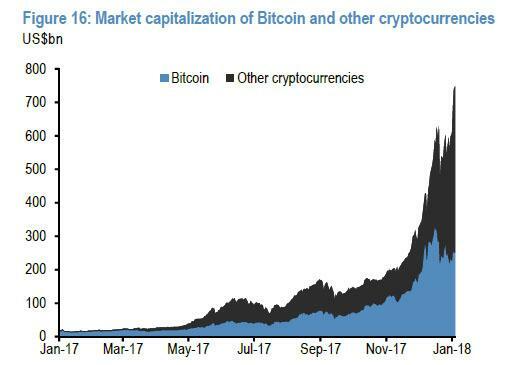 If the past 7 years - in which retail has consistently trounced "smart money" returns are any indication, bitcoin is about to soar as yet another major short squeeze develops in the coming weeks and months.